Who is behind Washington’s coup plot in Venezuela? Creating a distorted image of the humanitarian crisis is the starting point. Painting a picture of a country on the verge of collapse is the alibi. The coup plot against Venezuela has already been written and presented. On March 2, 2017, during the first round of OAS talks, Shannon K. O'Neil (Latin America director of the Council on Foreign Relations, CFR) presented the U.S. Senate Foreign Relations Committee with a portfolio of actions and measures to be taken by the United States if it wanted to remove Chavismo from political power in Venezuela. The CFR proposes three major political actions for the U.S. to execute a coup in Venezuela in the immediate future. Options that, because of the political and financial weight embodied in CFR, are already in full operation (and running for months). Indeed the CFR have directed the anti-Chavista leadership to strictly follow this coup manual. 1. CFR proposes to continue sanctions on "human rights violators, narco-traffickers and corrupt officials" to increase pressure on the Venezuelan government. Anti-Chavez leaders, following that script, have backed these actions and the false positive in question, since there is no evidence linking Venezuelan Vice President Tareck El Aissami to international drug trafficking. Even leaders like Freddy Guevara have gone to Washington directly to "demand" that the sanctions be extended, under the support of the anti-Venezuelan lobby led by Marco Rubio. 2. The United States must take a tougher stance within the OAS to implement the Democratic Charter against Venezuela, co-opting countries in the Caribbean and Central America to support this initiative, which in recent OAS (illegal) sessions have resisted supporting. Marco Rubio's threat against Haiti, the Dominican Republic, and El Salvador was not an isolated action, but a coordinated maneuver led by the State Department to increase pressure against Venezuela's international alliances. The CFR also proposes that the Treasury Department convinces China to withdraw its support for Venezuela to increase political and economic pressure on the country and the government. The MUD has been a stellar actor in this part of the script, using Luis Almagro to demand the Democratic Charter be applied against Venezuela. The latest statement from the U.S. State Department on the march convened by the MUD on April 19, aims not only to harden its stance toward Venezuela to increase pressure from the OAS (trying to bring together the largest number of allies with this critique), but legitimizes, with premeditation, violent and lamentable acts that could occur in the march. Clinging to false narratives such as the use of "collectives" to suppress demonstrations and "tortures" carried out by Venezuelan state security forces, the State Department proposes calling April 19 a turning point to escalate the siege against Venezuela and expand sanctions against the country, making them more aggressive and direct. 3. The CFR states that the United States should work together with Colombia, Brazil, Guyana and Caribbean countries to prepare for a possible "refugee increase," channeling resources to various NGOs and U.N. organizations from the United States Department of Agriculture State. But beyond this warning of an intervention in Venezuela, there is a real political operation in place: the NGO funded by the same Department of State, Human Rights Watch (HRW), published today, April 18, 2017, a report on how the "humanitarian crisis" has spread to Brazil. Based on specific testimonies and by magnifying immigration data, HRW took the opportunity to call on the governments of the region (with special emphasis on Brazil) to put pressure on the Venezuelan government, as required by the strategy proposed by CFR. Luis Florido, leader of Popular Voluntad, is currently touring Brazil and Colombia to try to reactivate the diplomatic siege against Venezuela from border countries. 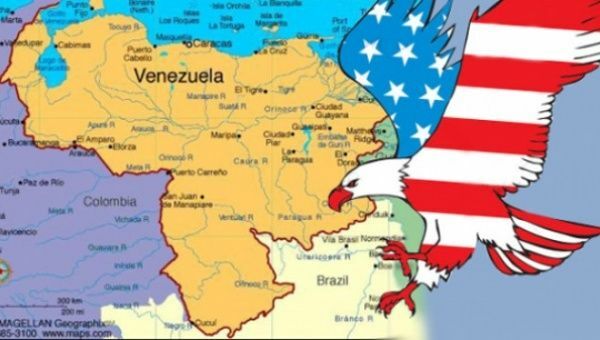 The U.S. think tank also requires that these countries under the leadership of the United States and the International Monetary Fund (IMF) organize a financial guardianship plan for Venezuela, that hides Russian and Chinese investments in strategic areas of the country. In recent days, Julio Borges has used his role in parliament and as a political spokesperson to continue the message that propagates the false narrative of the "humanitarian crisis" in Venezuela. It is the same strategy outlined by the CFR, arguing that the United States should increase its level of involvement in the internal affairs of Venezuela from the State Department, now headed by Rex Tillerson, linked to oil company Exxon Mobil (he was its general manager since 2007 until he took over this public position), a CFR financier. These ongoing actions, while unveiling the geopolitical urgency in the coup strategy against Venezuela (affiliated with the latest statements by U.S. Southern Command Chief Admiral Kurt Tidd on the need to displace China and Russia as allies of Latin America), also reflects how they have delegated the generation of violence, programmed chaos and diplomatic procedures (in the best of cases and exclusive use of Luis Florido) to their intermediaries in Venezuela, specifically, the leaders of the radical parties of anti-Chavism. These actions led by the United States (and corporations that manage its foreign policy) lead toward one final aim: intervention by financial and preventive military means.